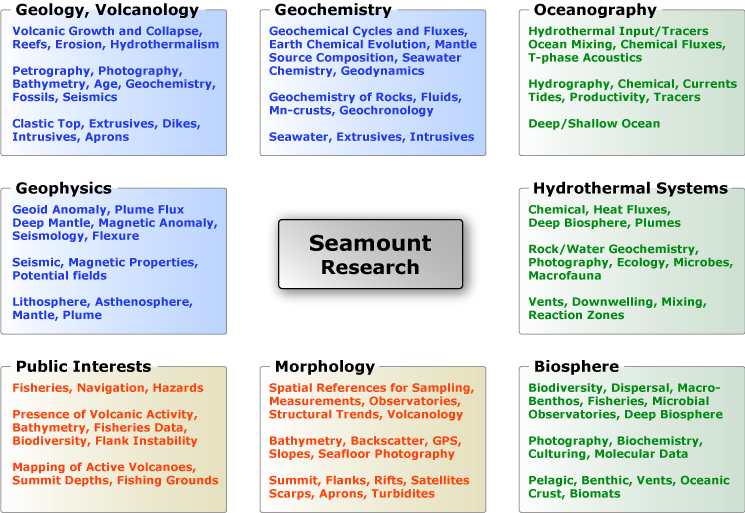 Seamount research involves many science disciplines that have much to gain from interfacing with each other (see chart below). Overcoming the challenges of interdisciplinary integration are important to a successful biological, geochemical, geological and geophysical exploration of the seamount interface between the hydrosphere, lithosphere and biosphere. The primary goal of the Seamount Biogeosciences Network (SBN) is to bring together all the diverse science disciplines involved in seamount research, to communicate about and discuss seamount science, and to explore innovative ways to network amongst the diverse communities working on seamounts. Our mandate is to form an international network of all seamount researchers, to organize workshops, to promote cross-disciplinary access to seamount data and databases, to facilitate new collaborations, and to explore new lines of seamount research funding. One of the major SBN goals concerns the development of a community website and database that integrates a wide range of seamount data. 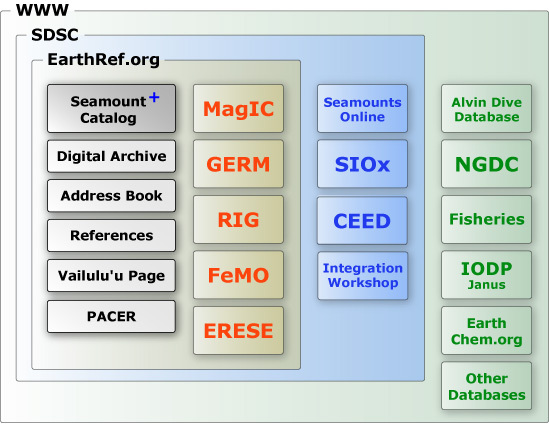 In order to establish a cyber-infrastructure on seamounts we are hosting SBN under http://earthref.org/SBN and we will use the Seamount Catalog as our main resource for finding basic information and maps about seamounts. More importantly, we will design the SBN website so that it will effectively become a "portal" or "springboard" on the web, where researchers can find out what kinds of data are available for each seamount and guide these users to the "authoritative" web resources on, for example, seamount macro fauna and biodiversity (SeamountsOnline), geochemistry data (EarthChem.org), cruise-related data (SIOexplorer.org), paleomagnetic data (MagIC), and so on. This means that SBN is not planning to collect any "real" data on the macro fauna or geochemistry of seamounts, for example. Instead it only seeks to include the necessary "metadata" (i.e. data about data) that will allow it to know what kind of data are available and where to find it on the world wide web. Besides the establishment of the above seamount cyber-infrastructure, the SBN website will also provide tools that will help the seamount science communities in other important networking tasks. These tools may include bulletin boards, online discussion forums, list servers, online seamount white papers, cruise planning tools and assistance in the organization of seamount-related workshops. Digital information that does not fit readily into existing databases will be maintained in the EarthRef Digital Archive (ERDA). SBN is a five year Research Coordination Network (RCN) project funded by the Biological Sciences (BIO) and Ocean Sciences (OCE) Directorates of the National Science Foundation (NSF). The PI's are also sponsored by the Scripps Institution of Oceanography (SIO). This funding includes besides the setup and maintenance of the SBN Web Portal means to organize two workshops and other small-scale meetings that will help us to increase visibility and recognition for seamount research. SBN has a Steering Committee and a group of Senior Personnel with representation from the international seamount research community. You can also become a Charter Member for a specific sub discipline in seamount research. Check the Who's Who Page to find out who's involved in SBN at this moment or Contact Us if you want to become a charter member! All database contributors and users are expected to adhere to the EarthRef.org Copyright Policy.